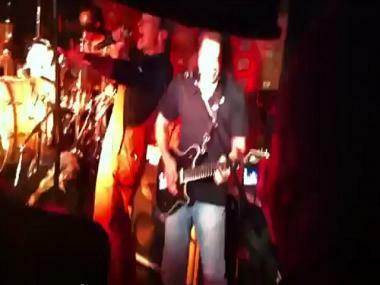 Van Halen Rocks Greenwich Village's Cafe Wha? MANHATTAN — Van Halen will play Madison Square Garden and other massive arenas when their 2012 tour kicks off next month, but the legendary rock band on Thursday night gave a few hundred of their faithful at Greenwich Village's own Cafe Wha? a taste of what to expect. David Lee Roth and company played an 11-song set at the packed, invitation-only show for music industry insiders and journalists at the MacDougal Street club, The Wall Street Journal reported. Roth praised the legacy of the basement club as his uncle Manny Roth, who founded the venue in 1960, looked on. 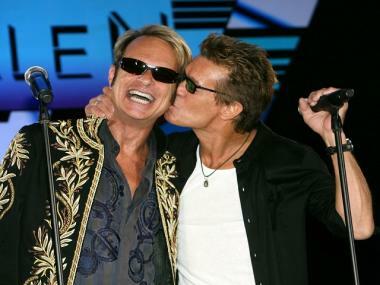 Van Halen singer David Lee Roth received a smooch from guitar player Eddie Van Halen at an August 2007 press conference announcing their 2007/2008 tour. Three members of the band's original lineup — singer Roth, Eddie Van Halen on guitar and Alex Van Halen on drums — plus Eddie's son Wolfgang Van Halen on bass, began the show with "You Really Got Me," Rolling Stone reported. They went on to play selections from their 1978 debut LP through their album "1984," including "Running with the Devil," "Ain't Talkin' 'bout Love," "Everybody Wants Some" and "Hot for Teacher." Dozens of fans without invitations to the show gathered at the back door of Cafe Wha? to try to listen, The Times reported. Van Halen played one new song, "She's the Woman," which will be included on their album due for release on Feb. 7, according to The Journal. The show ended with "Jump," but on the small stage, Roth had no room to do so. Wolfgang Van Halen, 20, took to Twitter to talk about the show. "Thank you to everyone for a wonderful night in NYC! See you all very soon... ;)" he wrote.